ምን ልበል ዳኒ ምን ልበል? ጭንቅ ጥብብ አለኝ! ኢትዮጵያውያን እንደ ዶሮ በየቦታው የምንታረድበት ምክንያት አልገባህ አለኝ! አሁንም ከዚች ሃገርና ከዚች ቤተክርስቲያን ጥፋት በፊት ሞቴን ያርገው እላለሁ! አቤቱ የሆነብንን አስብ!!!! ጠባቂ የሌለውን መንጋ ማን ይፈራዋል ? ማንስ ያከብረዋል ? ድህነታችን ከሐገር ሐገር አንከራተተን ምን ይሁን በሐገራችን ሰርተን አይደለም ቤተሰብን እኛን መደገፍ ካቻልን ከእጂ ወደ አፍ ከሆነ መኖራችን በስቃይም ቢሆን ሞትን ተጋፍጠን በረሐን ውቅያኖስን አቋርጠን መጓዝ ያንን ማለፍም ግዴታችን ነው ምክንያቱም ደሀ ነን ። ድህነትን ሳያዩ በሐገር ስለ መኖር ማውራት ቀላል ነው ቢሮ ላይ ተቀምጦ ስል እድገት ዲጂት መተረክም እንደዛው ሲኖሩት ነው ህመም እሚሰማው ። እንደዛ ባይሆን ሰው እያወቀ ሞትን እንዴት ይዳፈራል ? ሰማዕታቱስ ወደሚወዱት ጌታ ሄደዋል፡፡ ይህ ጊዜ ግን የኢትዮጵያ መንግሥትና የኢትዮጵያ የእምነት ተቋማት የሚፈተኑበት ጊዜ ነው፡፡ የግብጽ መንግሥትና የግብጽ ቤተ ክርስቲያን ለግብጽ ሰማዕታት ያደረጉትን በቅርብ ዓይተናል፡፡ የኛዎቹ በሚዛን የሚመዘኑበት ወይ ቀልለው ወይም ከብደው የሚገኙበት ጊዜ ላይ ነን፡፡ እግዚአብሔር ከሰማዕታቱ በረከት ይክፈለን፡፡ Amen Amen Amen !!! እረ ምን ተሻለን? ምን ዐይነት ጊዜ ደረሰን? መድሃሂያለም ምነው ዝም አልክ? ወላዲተአምላክ እመብርሐን እረ የት ሔድሽ ?ልጆች እንደ እንስሳት ሲታረዱ ምንድነው መፎትሔው ?እንዴት ነው የሚቆመው? ወገኖቼ ሰማዕትነት ተቀበላችሁ በረከታቹ አይለየን!! 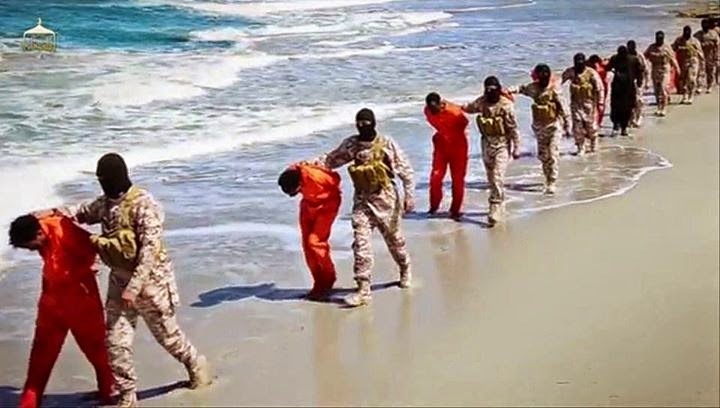 May God rest our brothers soul, but this a day we all christian learn profoundly something about this EVIL people. እኔ ድፍት ልበልላችሁ! የተሻለ ኑሮ ለመኖር ብላችሁ ወጥታችሁ ሰማዕትነት ተቀበላቹሁ! አቤቱ በመንግሰትህ አሳርፉቻው! 3 ethiopians in south africa killed. 700 ethiopians in mediterian sea dead. 30 ethiopians in libiya desert killed. Dn Daniel, you are going too far to mention here the church and government authoritis. It looks you need them to meet your expectations in handling this crisis. Your remarks show you don't have confidence in the authoritis they can defend their citizens. let us wait and see how they respond to this tragedy. Later we can comment. I burst into tears when i started writing....... I can't complete this. The public lost confidence on the so called "government" long ago. Daniels call should be considered an opportunity for the the government and authorities to narrow the gap... I can imagine what a zero reaction from authorities could cause... deepens the distrust. Not that the Martyrs needed anything earthly but the world watches how the Hen would react to its chickens in danger. How on earth would that guy say we are not sure, if they are Ethiopians, so shameful! Egypt responded within few hours in air attack, this government of Ethiopia should be overthrown. ኀዘኑ:- ሕዝብና አሕዛብ፣ዜጋና መንግሥት፣ምዕመንና ካሕን፣ጥሙቃን እና ኢ-ጥሙቃን…የማይል የሑላችንም ኀዘን ነው እንደማለት አስቀድሞ “መንግሥት ምን ይል ይኾን?ቤተክሕነት ምን ልትናገር ነው?” እያሉ በግብፅ ሚዛን ነገር ማስተንተን ከቶ ለምን ይኾን?የጋራ ቁሳላችንንም ማትረፊያ ልናደርገው? እግዚኦ…..
ልቅሶ ቤት ኾኖ ጣት መጠቋቆም ነውር ነው!! ሀዘኑ ልብ ይሰብራል ግን ደግሞ ስለመስቀሉ ፍቅር እስከሞት የታመኑ ልጆችን ስለወለዳችሁ ልትጽናኑ ፣ ደስ ልትሰኙ እና ልትመሰገኑ ይገባል፡፡ ከዚህ የበለጠ የክብር ሞት የለምና!!!!!!! በጌታ ቀኝ እንደሚቆሙ እናምናለን፣ እናውቃለንምና !!!!!!!!!! ተሣሃለነ በከመ ዕበየ ሣህልከ:: ሰአሊ ለነ ቅድስት "
Semaetat demachewn sile EGZIABHER afesesu sile mengisre semaytim merara motin tagesu!